Win an Insider’s Tour of the Carolina Panthers’ house! Did you ever wonder what goes on behind the scenes of a pro football team? What do those guys eat? Where do they keep the equipment? How does everything come together on Game Day? If the Carolina Panthers are your team, we can make your football fantasy come true. Get an up-close view of the Black and Blue with Prowl the Den, an insider’s tour of the Carolina Panthers’ house at Bank of America Stadium. 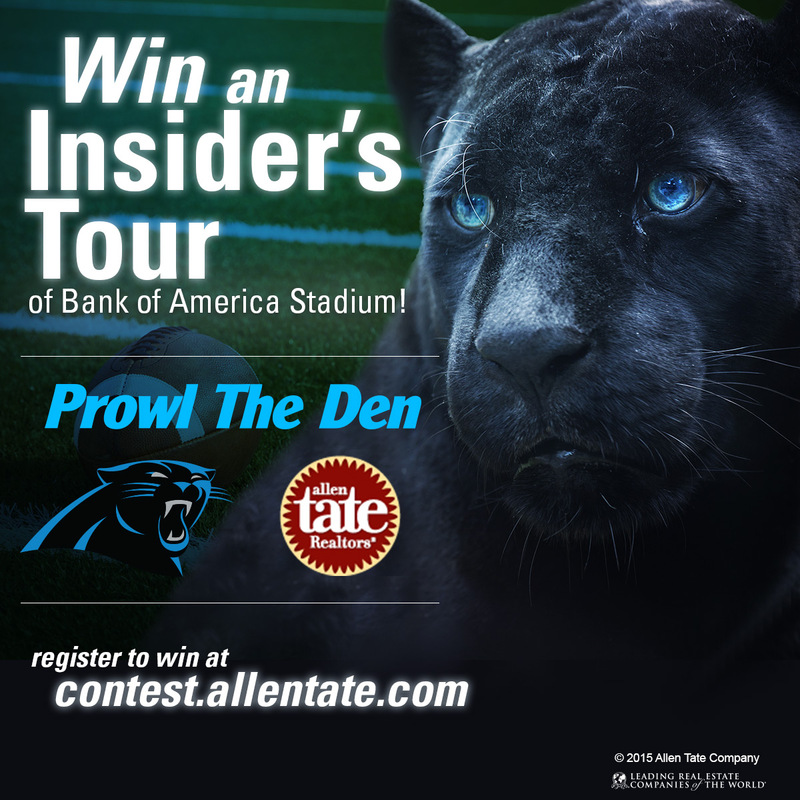 Sponsored by Allen Tate Company, an Official Partner of the Carolina Panthers, Prowl the Den lets you explore where the Panthers’ wins begin. But you must enter to win. At the end of the tour, one of the 25 tour winners will win a Grand Prize – four suite tickets and four field passes for the January 3, 2016 home game vs. Tampa and four replica Carolina Panthers jerseys. Tour winners must be present to win the Grand Prize. To enter, register at contest.allentate.com; contact an Allen Tate Realtor®; or stop by any Allen Tate sales office. No purchase is necessary. Contest is open to North and South Carolina residents age 18 or over at the time of entry, with a valid email address. Winners may bring guests age 5 and older. Limit one entry per person. Official rules may be found on the contest registration page. Contest ends at 11:59 a.m. on October 30, 2015. Tour winners will be notified on or before November 4, 2015. “In 2014, more than 11,000 people entered our Prowl the Den contest. That shows how many fans truly support our home team, the Carolina Panthers. This is a really fun, exclusive tour that will take you places not open to the general public,” said Pat Riley, president and CEO Allen Tate Companies. The Prowl the Den Contest began in 2013 and is the latest in a series of Allen Tate promotions with the Carolina Panthers since 2007. Other partnership events have included the “Crossing the 50” program, At Home with the Carolina Panthers photo contest, the Ultimate Fan Package Sweepstakes and Panthers Purrsuit social media challenge.